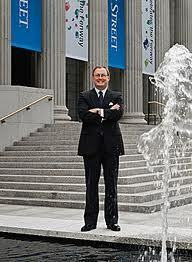 Malcolm A. Rogers, the director of the Museum of Fine Arts, Boston, is remarkably relaxed, considering. In November, in one of autumn's biggest cultural events, the museum will open an "Art of the Americas" wing, which not only expands its space by 28% and raises its profile exponentially, but which also, as Mr. Rogers puts it, is "central to my career." Mr. Rogers, a Briton who, hired by the MFA in 1994, raised $504 million for the whole revamp, considers it so meaningful, in fact, that he changed his nationality: "When I embarked on this wing, I became an American citizen, because how could I expect people to invest in it if I did not have a stake in it?" That was in 2003, but the venture's roots go back to at least 1999, when he controversially sacked a few veteran curators and merged several departments. He also began to hint that his new "Art of the Americas" megadepartment—which brought together paintings, decorative arts and antiquities from North, South and Central America—would one day fill a new building. But Mr. Rogers took his time. "One lesson I learned from going around to other museums is that if you add a wing thoughtlessly, you can mess up the flow of the whole museum," he says. 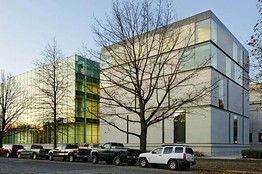 He cites the MFA's 1981 addition, designed by I.M. Pei for special exhibitions and contemporary art, as "way too successful. People didn't go to the rest of the museum." To counter that, Mr. Rogers restored and reopened the museum's historical entrances on the Fenway and on Huntington Avenue, which had been closed. And he hired London-based Foster + Partners to develop a master plan and design a new wing. "The brief was to complete the historical building and not upstage it," he says. He did not want "a showy outside." Well, there were other parts of the brief, too. For one, Mr. Rogers wanted the new wing, which projects from the museum's northeast side, to be transparent, and it is largely made of glass. That's "so people outside can see people inside and know you don't have to wear black tie to come in," he explains. "I want us to be more approachable." The four-floor expansion, designed with the MFA's 15,000-item Americas collection in mind, travels through time, from art dating to the first millennium B.C. on the lower-ground floor up to art through the 20th century on the top. "I don't feel the need to be controversial anymore," he says with a smile, "but I want to do new things." With the Americas wing, his unorthodoxy is somewhat retro. It will contain more than 5,000 works of art, compared with 2,500 on display before. "The sheer profusion of what we are showing" sends a message, he believes. In general, American art (which for the MFA stops, and turns into contemporary art, around 1955) is not a big draw. Yet it is popular among Boston's collectors, and represents a strategic choice for the MFA. "I wanted to do something that would express what an extraordinary country this was," Mr. Rogers explains. "And I wanted to represent the whole of the Americas." The museum's chestnuts—like John Singleton Copley's "Paul Revere" and Joseph Stella's "Old Brooklyn Bridge"—will still be on view. But the MFA has added to its trove and, more important, has gone into its rich storerooms. One such glorious work plucked from storage is Thomas Sully's "The Passage of the Delaware," a view of George Washington, on a white horse, at the famous military turning point; it predates by 32 years Emanuel Gottlieb Leutze's iconic 1851 "George Washington Crossing the Delaware" at the Metropolitan Museum of Art. Sully's painting, acquired in 1903, has never been on view in its original gilt frame (now restored) or with other American paintings, because, at 12.2 feet by 17.25 feet, it never fit into MFA's American galleries. Benjamin West's "King Lear" and Copley's "George IV When Prince of Wales" were likewise hidden away for lack of large-scale space. Two Victorian period rooms, acquired in 1977, are also making their debut, as are new items like a David Smith sculpture and a ceramic bowl painted by Jackson Pollock. The galleries themselves vary, with wall colors shifting from light gray to deep blue to a flocked, red-and-gold wallpaper that re-creates a pattern from a home of John Hancock. Walking with me through them, Mr. Rogers comments: "It's important to create a stage setting, and to do things differently in different galleries." Many—22 of 46 (there are also four "behind the scenes" galleries and three for rotating exhibits)—are what he calls "3-D," meaning a mix of paintings, sculpture, decorative art, textiles, costumes and musical instruments. In the past, MFA segregated its galleries by media. There are other statements as well. Mr. Rogers, who was deeply involved in the planning with Elliot Bostwick Davis, the wing's curator, singles out a gallery for American Renaissance works by such artists as Abbott Thayer, Frank Duveneck and Edwin Austin Abbey. That's an "in-your-face" move: "These are largely unfashionable works that I want to be fashionable again." Mr. Rogers also decreed that John Singer Sargent have a room of his own, filled with 28 works from all periods of his career, in all media, including his masterpiece "The Daughters of Edward Darley Boit." "Sargent is so central to Boston, I wanted a 'destination gallery' for him," he says. Around the corner is an inspiration of Ms. Davis: a gallery devoted to works chronicling Americans on the Grand Tour and hung salon-style, covering the crimson cotton damask walls top to bottom. Others include a gallery that pits Winslow Homer against Thomas Eakins, one for Copley, one for abstract works and another for American Modernism. Though hardly anything seems "missing" from the American art narrative, Mr. Rogers concedes that some parts are sketchy: "There are still collections out there that could still come and help us tell the story," he says. And he'll no doubt be wooing the owners. As he sees it, running a museum is like maintaining a monumental bridge: As soon as you finish painting it, you start all over at the opposite end.